As you probably notice I am very busy lately. 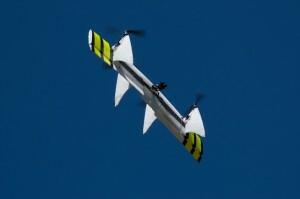 Together with some friends we were working on the Quadshot an aerobatic blend between a quadrocopter and an airplane. 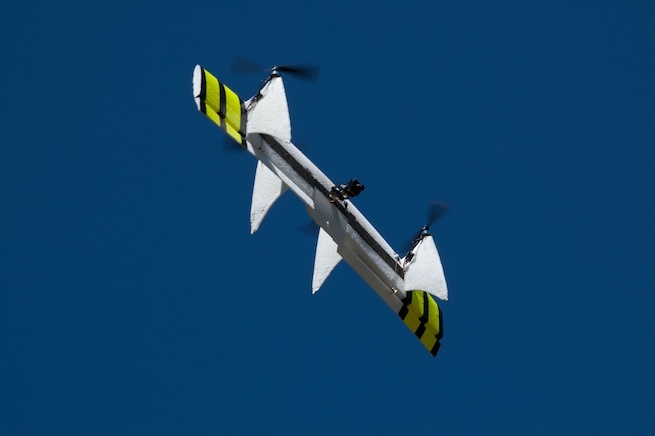 It takes off and lands vertically like a quadrocopter as well as it can fly forward like an airplane using its wing to add additional lift extending flight time. We submitted the project to Kickstarter and we are very happy to see that we got such a great response. The Kickstarter funding runs for another three days and if you pledge you can get a Quadshot at a discounted price as a reward. At it’s heart Quadshot is using the avionics and software framework of Paparazzi. We developed the additional necessary controls for Quadshot and released them. So Quadshot has Open-Hardware electronics and Open-Source firmware making it a great platform for research and hacking. Having an autopilot makes it also very easy to fly for a beginner RC pilot. This entry was posted in Projects and tagged airplane, Kickstarter, paparazzi, quadrocopter, Quadshot, RC, UAV on September 15, 2011 by esden.